Main Street Gazette: Who is the Rocketeer? The Rocketeer celebrated the 20th anniversary of the film’s release last month. When the feature was first released, the popcorn-munching flick that made every boy dream of flying (myself included), there were details from The Rocketeer in almost every corner of Disney-MGM Studios. In fact, a scene from the final production had even been shot in front of the replica of Grauman’s Chinese Theater. Elsewhere, the Bulldog Cafe sat alongside other popular facades in the backlot and the Rocketeer himself could even be seen flying above the Great Movie Ride during the fireworks spectacular known as Sorcery in the Sky. These days, the Rocketeer still has a home in Disney’s Hollywood Studios. Most guests are aware of the frozen beverage station, Peevy’s Polar Pipeline, replete with replicas of Peevy’s rocket jet pack drawings, the jet pack and ‘hood ornament’ helmet. 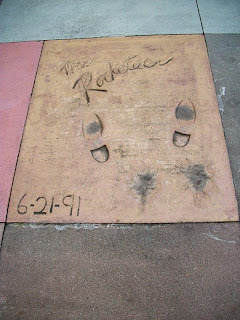 Lesser well known, though still a sought after spot, is the Rocketeer’s handprints in front of the theater, though perhaps ‘hand’ isn’t the particularly right word in this situation. 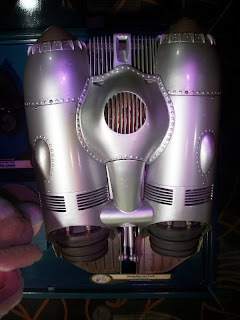 But what about those fans who want to see more from The Rocketeer represented in the parks? Well, then you’re in luck as there are still two spots to stop in at. First, over at One Man’s Dream, just before the entrance to the film portion of the tour, are display cases feature classic cult films. While a Dip Mobile model from Who Framed Roger Rabbit? and helmet from TRON each draw their own crowds, or some of the same swooning fans, it is the Rocketeer’s Jet Pack that we’re interested in today. Shining in the exhibit light, the jet pack looks as if it is brand new and ready for its first flight. Where is Cliff Secord when you need him? The last stop on our Rocketeer tour takes us to the Studio Backlot Tour. After watching the water tank demonstrations, guests are ushered through a prop house on their way to boarding a tram tour. It is a shame guests can’t spend more time in this facility, as there are shelves and shelves filled with wonderful pieces of movie history just begging for the opportunity to be ooh’ed and ahh’ed. 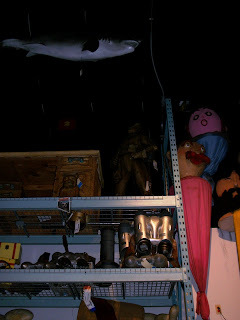 One particular section of elevated shelving features an array of objects from The Rocketeer. Included on the two shelves is a photograph of the Bulldog Cafe, a helmet, no less than five jet packs, and even the statue of ‘Lucky’ Lindy, who became Cliff and Peevy’s test pilot for the jet pack. 20 years out, and The Rocketeer still has a rabid following and some well placed nods inside Disney’s Hollywood Studios. While the film may not hold as prominent a spot in the park that it once did, it is still given high honors where it is included. 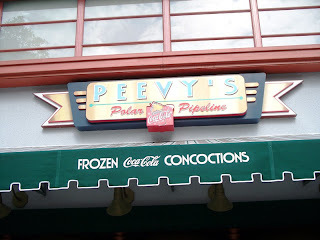 For fans of The Rocketeer, these locations are must visits when at Disney’s Hollywood Studios. I did want to say that I agree with you - I wish that we were able to stay longer on the way to the tram for the Backlot tour. I am always so mystified by all the stuff packed in there. I'm also curious by nature and nosey. :) That would be a nice improvement one day. As always, love the blog! Thanks again for all you do!